Say hello to the Glovius App for your iPhone, iPad and iPod Touch! Glovius is a high performance 3D viewer for your iPad and iPhone. Pinch to zoom, single finger drag to rotate, two finger drag to pan, two finger rotate to roll the model and double tap on the screen to reset the model. Perform simple cross-sections (on XY, YZ, XZ clip planes) with Flip Clip Plane and Clip Profile support. You can also take snapshots of the model and save and email them. Snapshots can be viewed in the Photos App. Email a snapshot with the “Compose Email” dialog with the model snapshot already attached. To download models on your device, create a free account on Babel3D.com. 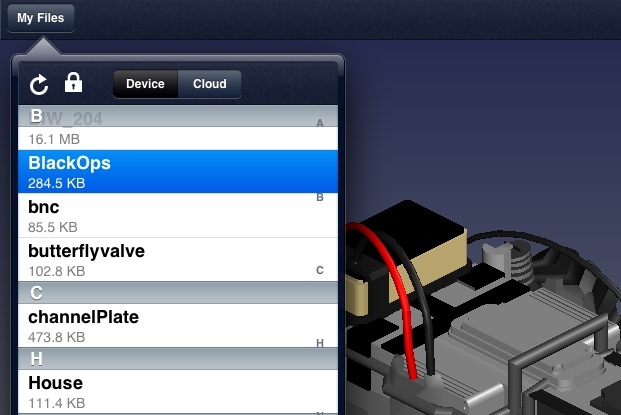 Upload your SketchUp/3DS/OBJ/STEP/IGES/JT/STL files and select “iPad” as output format. Now login from within the Glovius app to download. SketchUp (*.skp), 3DS (*.3ds), OBJ (*.obj), STEP (*.stp; *.step), IGES (*.igs; *.iges), JT (*.jt), PLMXML (*.plmxml) and STL (*.stl) files are supported. Support for more formats is coming soon. You can also export your JT/STEP/IGES/PLMXML models from the Glovius for Windows app and get them on to your device using iTunes.